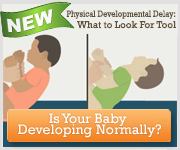 What are some of the developmental milestones my child should reach by one month of age? In the very beginning, it may seem that your baby does nothing but eat, sleep, cry, and fill his diapers. By the end of the first month, he’ll be much more alert and responsive. Gradually he’ll begin moving his body more smoothly and with much greater coordination—especially in getting his hand to his mouth. You’ll realize that he listens when you speak, watches you as you hold him, and occasionally moves his own body to respond to you or attract your attention.